The contact lens display with the dollar sign held next to a human eye. 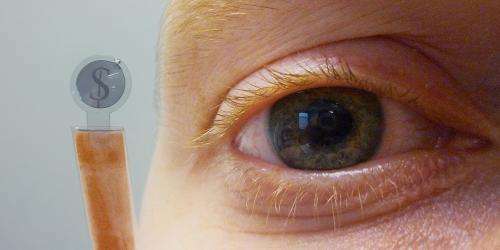 The Centre of Microsystems Technology (CMST), Imec's associated laboratory at Ghent University (Belgium), announced today it has developed an innovative spherical curved LCD display, which can be embedded in contact lenses. The first step toward fully pixelated contact lens displays, this achievement has potential wide-spread applications in medical and cosmetic domains. Unlike LED-based contact lens displays, which are limited to a few small pixels, imec's innovative LCD-based technology permits the use of the entire display surface. By adapting the patterning process of the conductive layer, this technology enables applications with a broad range of pixel number and sizes, such as a one pixel, fully covered contact lens acting as adaptable sunglasses, or a highly pixelated contact lens display. The first prototype presented today contains a patterned dollar sign, depicting the many cartoons that feature people or figures with dollars in their eyes. It can only display rudimentary patterns, similar to an electronic pocket calculator. In the future, the researchers envision fully autonomous electronic contact lenses embedded with this display. These next-generation solutions could be used for medical purposes, for example to control the light transmission toward the retina in case of a damaged iris, or for cosmetic purposes such as an iris with a tunable color. In the future, the display could also function as a head-up display, superimposing an image onto the user's normal view. However, there are still hurdles to overcome for broader consumer and civilian implementation. "Normally, flexible displays using liquid crystal cells are not designed to be formed into a new shape, especially not a spherical one. Thus, the main challenge was to create a very thin, spherically curved substrate with active layers that could withstand the extreme molding processes," said Jelle De Smet, the main researcher on the project. "Moreover, since we had to use very thin polymer films, their influence on the smoothness of the display had to be studied in detail. By using new kinds of conductive polymers and integrating them into a smooth spherical cell, we were able to fabricate a new LCD-based contact lens display." Prof. Herbert De Smet, who is supervising CMST's display group further comments: "Now that we have established the basic technology, we can start working towards real applications, possibly available in only a few years time. While this is an achievement, I don't see how you can use it in a contact lens without problems arising from connecting it to some electronics. How will the lens stay over the pupil when you move your eyes? An excellent next step. I can't wait for its final form. Maybe, if Google Glass is successful, R&D on contact displays will be accelerated.